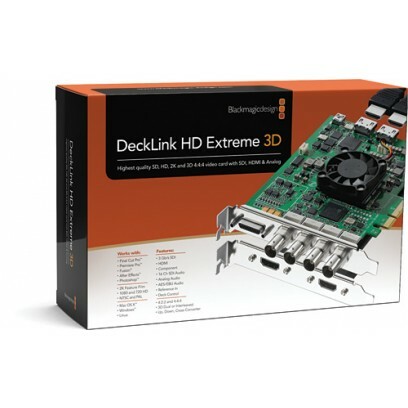 The Blackmagic Design DeckLink HD Extreme 3D is a video-editing hardware, which features single and dual-channel SDI capture and playback for both regular 2D as well as new 3D stereoscopic workflows. It includes dual link 3 Gb/s SDI, HDMI, analog component/composite/S-video connections and 2 channels of AES/EBU audio in and out with a sample rate converter on the AES/EBU input as well as 2 channels of XLR professional analog audio in and out. It is the first capture card to include high speed 3 Gb/s SDI connections for 4:4:4 RGB, 2K film, and 3D; the 10 Gb/s super fast connectivity makes for superior real-time effects. The video formats can be instantly switched between SD, HD, and 2K up to 1080p60. This unit is compatible with NTSC and PAL formats.